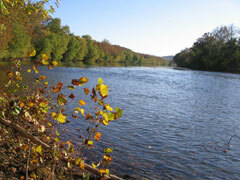 A doorway to wilderness trails, mountain streams, peaceful meadows, the Shenandoah, and the “still point” within. First floor bedroom: Sleeps 3 with one twin and a trundle–2 twins/King. 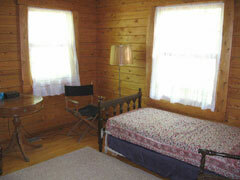 Cottage: Sleeps 3 with Double futon, twin pull-out. kitchen, living and dining room. wifi with highspeed satellite internet connection. 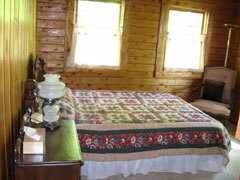 The Cabin is a 1300 square foot two-story log cabin built in 1985. 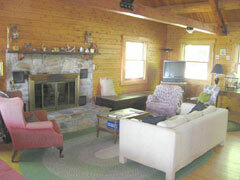 The Retreat Cabin has central airconditioning and forced air heating, as well as a fireplace for additional heat. The dining room comfortably seats eight people. The living room has a fireplace, a cathedral ceiling, and comfortably seats about twelve people. 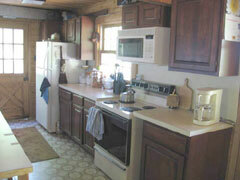 The kitchen is fully equipped with microwave, electric stove, refrigerator. 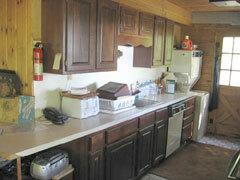 The kitchen also has a dishwasher, as well as a washer and dryer. 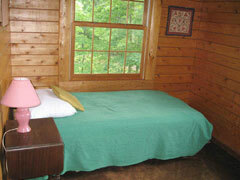 The upstairs bedroom sleeps up to 3 wit a queen size bed, twin pull-out and a large closet. 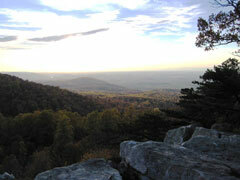 The second upstairs sleeps 2 with two twins and a lovely view of the Shenandoah Valley. 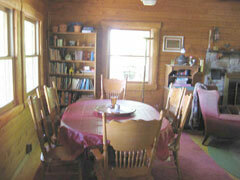 The writer’s cabin out back has an airconditiioner, heater, and a double bed. It also has a deck and composting toilet (not shown). It sleeps 3 with Double futon, twin pull-out. 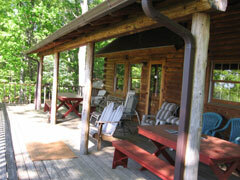 The cabin’s large back porch offers a panoramic vista view of the Shenandoah River and Valley. 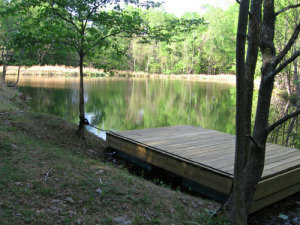 The pristine, spring fed pond is a two minute walk from the cabin and is 20 feet deep at center. Take the oars to steer the swimming dock to the middle of the pond, and jump in. The pond straddles land owned by StillPoint and the Rolling Ridge Foundation. 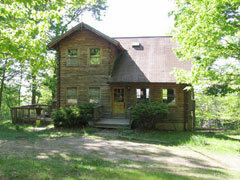 The cabin is a one-minute walk from the Ridge to River Trail. 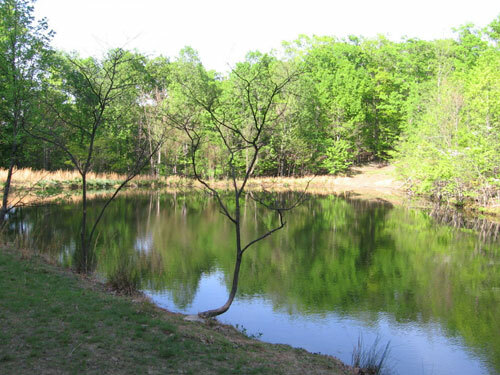 This trail is maintained by the Appalachian Trail Club and runs from the Crescent Rock scenic overlook at the top of the Blue Ridge mountain down to the Shenandoah River. 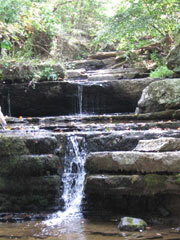 You are just a one minute walk to the Rolling Ridge 1400-acre wilderness preserve, home to five mountain steams and cascading waterfalls. This waterfall is just a 15 minute hike from the cabin. 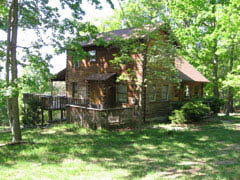 The cabin is within a quarter mile easy walk to the Shenandoah River. 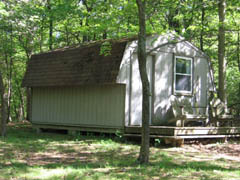 The cabin’s lot is bordered on two sides by Rolling Ridge Foundation land.